Property developer MK Land Holdings Bhd expects the first phase of the affordable homes development project in India to be launched in March next year. Executive chairman Tan Sri Mustapha Kamal Abu Bakar said the project will be a replication of the successful model of Damansara Damai, a low medium cost township developed by its subsidiary, Medan Prestasi Sdn Bhd. "We are in the stage of planning and hope to launch the first phase in March next year because there is a pent-up demand for properties," he told reporters after launching construction works for a bus terminal in Damansara Damai, in Petaling Jaya, Selangor yesterday. MK Land via its subsidiary Ritma Mantap Sdn Bhd, is in partnership with Embassy Group of India to develop and construct a 120ha township in northern Bangalore, India. With a total gross development value of RM3 billion, the project is being undertaken by Milan Gateway Sdn Bhd, where MK Land and Embassy Group each holds 47.5 per cent while MKN Embassy Development Sdn Bhd has 5 per cent. Construction is expected to take off next year while completion will take about five years. It will potentially deliver 16,000 units of affordable homes and about 560 units of retail outlets. Meanwhile, MK Land has spent RM1.9 million to set up the bus terminal in Damansara Damai known as Wan's Central. The terminal is to provide transportation facilities in the township with a population of more than 90,000. Along with the bus terminal, there will be also 32 affordable shop units specially built for local retailers and traders. A systematic approach will be taken to build the shop units to allow proper traffic flow along the roads. The Damansara Damai housing estate developed by Medan Prestasi is a housing scheme under the Selangor government privatisation project. The project encompasses 75 per cent low-cost and middle-cost homes as well as other properties including condominiums and commercial lots. Among the bus companies which will operate at the 0.5ha bus terminal due for completion in November are Selangor Omnibus, Rapid KL and Metrobus. Todate, more than 14,000 properties worth RM1.2 billion have been sold. Prestasi also has on its planning board projects with gross development value of RM782 million. The projects include the Seasons Square Block A condominium worth RM115 million and the Armanee Block D condominium worth RM88 million. A high-end condominium which is located close to established amenities and facilities is always a draw for potential housebuyers. This is being offered by Palmex Industries Sdn Bhd through its latest RM175mil Fettes Residences Condominium project in Jalan Tanjung Tokong on Penang island. Those interested can check out the company’s booth at the Star Property Fair. The 35-storey block on freehold land consists of 195 luxury condominiums. The company’s general manager Ang Hooi Eow said the project was located within the vicinity of established amenities and facilities at one’s convenience. “It is just a five-minute drive from Gurney Drive, home to Penang’s most famous glitzy shopping mall Gurney Plaza,” he said in an interview. Other amenities which are nearby include healthcare services, international school and colleges, modern shopping complexes and sandy beaches. Priced from RM836,800, each unit has a built-up space of 2,000 sq ft onwards complete with resort-styled recreation and facilities. The facilities available are swimming pool and children’s pool, gymnasium, snooker room, table tennis room, barbecue centre, basketball court, skate board rink, water feature and fountain, children playground, resting kiosks, leisure walking path and jacuzzi at swimming area. “Besides, we also have a 22,000 sq ft landscaped area and an interior landscaped garden,” he said, adding that the project was scheduled for completion in June 2011. Ang said 35% of the units had been sold. “Those interested in buying the units will receive a special promotion package during the fair. “They will also benefit from zero bank interest during construction. We expect many enquiries during the fair,” he said. Ang said each unit was allocated two covered car parks and there would be four high-speed lifts in the block to minimise waiting time. “Despite all the facilities, the monthly service charge for each unit is only RM400. The Star Property Fair 2009, organised by The Star in collaboration with Henry Butcher Malaysia and supported by The Expat Group, will feature the creme de la creme of property at the G Hotel. A ‘lifestyle’ section has also been introduced as an extension of the fair at the Gurney Plaza where visitors will find a varied selection of home improvement products and offerings with the aim of converting a property into a dream home. The Star Property Fair in Penang is back again with bargains and deals for those seeking to get the home of their dreams or to furnish their existing property. 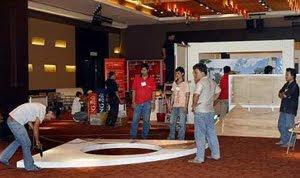 Exhibitors and their workers setting up their booths at G Hotel for the Property Fair. The three-day fair at G Hotel (Level 2) and Gurney Plaza’s new wing ground floor concourse area, which starts today, will showcase the latest property complemented by a lifestyle section. The Star regional manager operations (north) Chung Chok Yin said visitors could expect more higher end property on display. “We changed the venue of the fair this year from the Penang International Sports Arena with the aim to attract a different target audience. “We are having more up market products at prime locations. Considering the pricing of property in Penang now, the deals showcased will be good bargains for potential buyers,” Chung said after visiting the exhibition venue yesterday. He said the fair aimed to help developers reach out to the more affluent segment of the society. “We are also targeting the expatriates who are looking for property here,” he added. The fair will feature more than 70 exhibitors with about 150 booths. The exhibitors include property developers, lifestyle product companies and financial institutions. Among the developers are Henry Butcher Malaysia (which is also the technical adviser for talks and forums), Ivory Properties Group, SP Setia, IJM Land Bhd, Belleview Group, Mah Sing Group, PJ Development Group and Ideal Properties. For the lifestyle section, exhibitors include Syn Hoo Lim, Matrix Kitchen, Jia Yee, Pensonic, Solar Tech, Door Decor, B.L.Furnishing Sdn Bhd, Groupe SEB and Home Focus Sdn Bhd. There will also be an auction for the painting ‘Nostalgic Phenomena’ by artist Koay Soo Kau. The auction will take place throughout the fair and the reserved price is RM10,000. The proceed will go to the Penang Hospice. There will also be 25 other paintings on sale from which 30% of the proceeds will be channelled to Penang Hospice. Visitors to the fair stand a chance to win fabulous prizes from the Surf, Click & Win and Lucky Catch contests. Organised by Star Publication in collaboration with Henry Butcher and supported by The Expat Group, the Star Property Fair 2009 is open from 10am to 10pm daily over the three days. PETALING JAYA: MK Land Holdings Bhd’s joint-venture development in Bangalore, India, is set to be a catalyst for the company’s foray into the international property market, says executive chairman Tan Sri Mustapha Kamal Abu Bakar. “The project will be launched in March after we get all the approvals from the authorities involved,” he said yesterday after officiating the start of construction works for a bus terminal in Damansara Damai. “We are being recognised by India as having the expertise to build projects that focus on affordable houses such as the ones we develop in Damansara Damai,” he added. MK Land’s housing project in India has a gross development value of RM3bil, according to Mustapha. He said the company first got involved in affordable housing in the 1990s to help solve the problems posed by squatters. “Now, our efforts to help these people have opened the eyes of other countries such as India to replicate this kind of concept,” he said, adding that the perception that low-cost housing did not bring much profit was not true. Such projects can be lucrative if done in big volumes, according to Mustapha. “To date, we have sold more than 14,000 houses valued at about RM1.2bil. Damansara Damai is now being populated by more than 90,000,” he said. PERMODALAN Nasional Bhd (PNB) will intensify its investment in the property sector by developing its 7.2-ha land near Merdeka Stadium. Group president and chief executive Tan Sri Hamad Kama Piah Che Othman said the mixed development project would start next year. Property was a new source of income for the company and "PNB will intensify its property investment because we want to ensure each property belonging to PNB brings suitable returns," he said. PNB would ensure the project meet market expectations and give added value to its investment, he told reporters after giving away donations to seven orphanages in Selangor today. On Amanah Saham 1Malaysia, Hamad Kama Piah said about 2.4 billion units had been subscribed so far. The unit trust was launched by Prime Minister Datuk Seri Najib Tun Razak on July 31 with a size of 10 billion units.